Could a Mysterious, Brand New Planet Be to Blame for Our Tilted Sun? A new study released this week said that a distant, undiscovered planet may be responsible for the wobble in our solar system, tilting the planets by as much as six degrees. The culprit? The mysterious Planet Nine, said to be lurking deep in the Milky Way. "Because Planet Nine is so massive and has an orbit tilted compared to the other planets, the solar system has no choice but to slowly twist out of alignment," said Elizabeth Bailey, lead author of the study announcing the discovery. Here's a look at nine things to know about the mysterious Planet Nine. 1. What is Planet Nine? It's mind-blowing to think we might not yet have a complete census of what's really in our solar system. Planet Nine's possible existence was pinpointed through mathematical modeling and computer simulations, but no one has laid eyes on it yet. 2. Where is this hypothetical Planet Nine located? At its farthest point, it may be about 155 billion miles from the sun, putting it beyond the demoted dwarf planet, Pluto. For some perspective, Earth is 93 million miles from the star. Planet Nine is believed to have a gaseous quality, making it similar to Uranus and Neptune. 3. Where did Planet Nine come from? It may have formed near Uranus and Neptune, according to researchers at the California Institute of Technology in Pasadena, who shared compelling new evidence of Planet Nine's existence earlier this year. It's theorized an encounter with gas giant Jupiter may have ejected Planet Nine to its current place in the boonies of the solar system. Another theory says Planet Nine could be a "captured rogue planet" from another planetary system, being pulled into our solar system by the sun after it was ejected. 4. It may be tilting our solar system. The reason for the sun’s crooked angle has never been explained. But space nerds have long been enamored with the idea of Planet Nine and the fact that it could explain some of the other curiosities of the solar system, such as why the sun appears to be tilted. What Are Eclipses Like on Other Planets? 5. It's a big deal...literally. Planet Nine is estimated to be 10 times the size of Earth, making it about the same size as its nearest neighbor, Neptune. It's also estimated to be 5,000 times the mass of Pluto, which the world got its closest look at yet when New Horizons flew by in July 2015. 6. Planet Nine's existence can explain some other space oddities. Planet Nine appears to orbit 30 degrees off from the existing eight planets, possibly influencing the orbit of objects in the Kuiper Belt, a region of the edge of the solar system containing icy bodies. Two researchers noticed the bizarre orbit of 13 Kuiper Belt objects in a 2014 paper, suggesting they may orbit a planet — prompting more people in the science community to set their sights on the existence of the so-called planet. 7. It has an unusual orbit. It's estimated Planet Nine would take anywhere from 10,000 to 20,000 years to orbit the sun. Its highly elongated orbit is believed to be, on average, 20 times farther from the sun than its neighbor, Neptune. 8. There has only been two "true" planets discovered since ancient times. If scientists can prove the existence of Planet Nine, it would be a huge achievement. 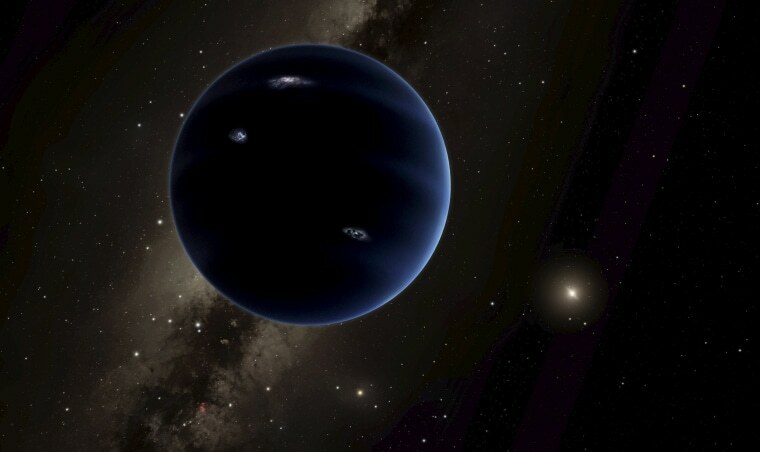 "This would be a real ninth planet," said Mike Brown, a professor of astronomy at Caltech who has studied Planet Nine, in a statement earlier this year. "There have only been two true planets discovered since ancient times, and this would be a third," he said. "It's a pretty substantial chunk of our solar system that's still out there to be found, which is pretty exciting." Those two planets — Uranus and Neptune — were discovered in the 18th and 19th centuries, respectively. Pluto would have been the third but was demoted to dwarf planet status in 2006. 9. Scientists believe we're close to getting our first look at Planet Nine. We could be a matter of years away from getting any photographic evidence of the planet, researchers say. One way may be through the Hubble Space Telescope, although it would likely only be able to snap an image measuring a few pixels across.